Where is she just not «turned black», this nippy! I’m not even talking about forests and country houses, you can meet this mushroom in Moscow parks. True, collect mushrooms I do not advise in the city — they absorb a lot of rubbish from the Moscow air. Chernushki parade with the whole family, as a rule, in the fall, but what’s the point? Few people believe that this mushroom can cook something worthwhile. And very much in vain! I went to the forest for mushrooms since childhood. So it was accepted in our family: holiday weekend rest — a hike in the forest for mushrooms. Even if crop failure occurred, the tradition continued. The forest started almost outside our summer cottage in the village of Kratovo, so everyone who was indifferent to mushroom hunting could easily return to the lounge chairs, which they did. And my dad and I persistently continued to explore the spruce forests and birch groves in search of prey. And I do not remember that the baskets ever remain empty. The success was simply explained: papa was sure that all the mushrooms were edible, except for two types: pale toadstool and mushroom. A special place among us was occupied by campaigns for honey mushrooms and chernushki — my grandfather harvested these mushrooms for the winter. Marinated mushrooms, salted and black cumin. It was possible to open a jar of pickled mushrooms at any time, but Chernushki ripened only for the November holidays. I did not take part in the discussion, I always liked the mushrooms unconditionally. Now I understand that these Chernushki can not even be called salty — most likely they were fermented. Many years have passed since then, I have been to different countries and tried many things, but the fermented crumbs of my childhood have not been served anywhere. Even the vaunted «Rublevsky» grandmothers with supposedly home milk mushrooms they did not stand near the enameled pan of salted chernushki, harvested by my grandfather. Then one day my husband decided that we should visit the village of Pashkovo in the Penza region. There, at the age of five, he spent the summer in the house of his grandfather and grandmother, after which the house was sold. Memories, however, remained, and at some point they took shape in a real desire. From Moscow, only 600 km, first along the broken federal highway, then along the rural off-road. There is simply no asphalt in the village of Pashkovo — all the roads are solid sand. But we arrived, and found a house, and remembered childhood. And the forest around the village! Not a forest, but a park! This is where the real milk mushrooms should be, I thought, and asked the local old woman: “What, are you salting mushrooms?” — “No, dear, there is no one to collect, except ask in the fifth house, they go to the forest”. In the fifth house they really salted mushrooms. The hostess sold a three-liter bank of gruzdey for ridiculous money. One glance was enough for me to understand: it is THEY. I was not mistaken, and enjoying the contents of the can with pleasure, I thought: no more than nostalgic, it’s time to get down to business. And at the first opportunity (mushroom, of course) went to the forest. Gruzdey I collected so many blacks that they hardly fit in the trunk of a car. But they filled the bath very well. The fact is that the black weight must be soaked before harvesting. At the fracture of the fungus stands out white juice, which tastes bitter. According to science, it is necessary to soak for two days, changing water twice a day. But I soaked three days and changed the water once a day, just lazy. But with the help of the shower I washed the fungi with running water. On the third day, they decreased in size — this is a sure sign that it is time for them to pickle. You can read the recipe for cold or hot pickling anywhere. I pickle up without any recipe. Rather, combining hot and cold pickling. After soaking, I put each fungus in boiling water — thirty seconds, not more, just to tell the doubters with confidence: eat — do not get poisoned. After the procedure, put the mushrooms in an enamel pot. It is possible in a wooden container, but never in a copper or aluminum. If the mushrooms produce little juice, add salted water. 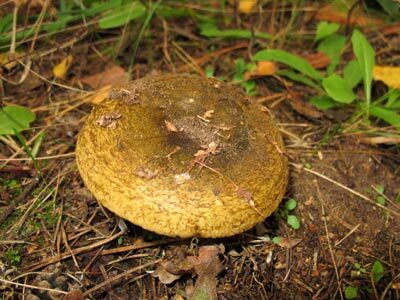 If the autumn is warm, mold can form on the surface of the mushrooms. Remove the top layer, boil gauze and add the vegetable oil or vodka to the mushrooms. Lay out ready-made mushrooms on banks in such a way that they tightly occupy the entire volume. Top with vegetable oil and cover with fresh garlic. The process of laying is as follows: on the bottom — compulsory salt, pepper, dill, garlic and bay leaf, then mushrooms with caps down in one layer and then in a circle. Optionally, you can add leaves or roots of horseradish, cherry, oak, currant leaf or cloves. Now, about salt: according to recipes, 40–50 g of salt are taken for every kilogram of mushrooms. Never measured. I pour salt on the mushroom layer generously, then press it down with my hands: if a liquid is liberated, it means that there is enough salt. When the container is full, I close everything up with pure gauze, a wooden circle on top, oppression against it. And in this form I can stand on the balcony — I would, of course, put the mushrooms in the cellar, but in my Moscow apartment there is no such. Therefore, in order to create a cellar effect, I cover with a dark cloth on top, but not dense — the mushrooms need an autumn cool. In this form, the fungi are stored for 45 days. Blackberries are collected in the autumn, so the salted fungus will be ready for the November holidays. You can eat them in two weeks, but these are completely different salted mushrooms. And after 45 days, they turn sour and acquire a unique taste, repeatedly described by Russian classics. When the product reaches a condition, it should be decomposed into glass jars and stored in the refrigerator. Shelf life — a year. Try to cook, sure, get carried away!